This is absolutely amazing! I can't wait to build my own! Thank you! Wow! Thank you! I have been looking all day, and this is by far the best tutorial AND the best idea! I love that it is 3 in 1. Absolutely perfect! For the PVC pipe & fittings you could make the stand for about $25. The 10' lenghts are about $2, and the fittings vary. I buy the clamps at harbor freight and they are just under a dollar each, and that is also where I got a hack saw (I think) for about $10. I think baseboard is about one or two dollars a foot, but don't quote me on that! :) While you're at the hardware store check out their snap together laminate flooring. You can buy a case (which will give you about a 4' by 5' area) for around $20. Thanks for asking! Best of luck. I'd love to see what you come up with! 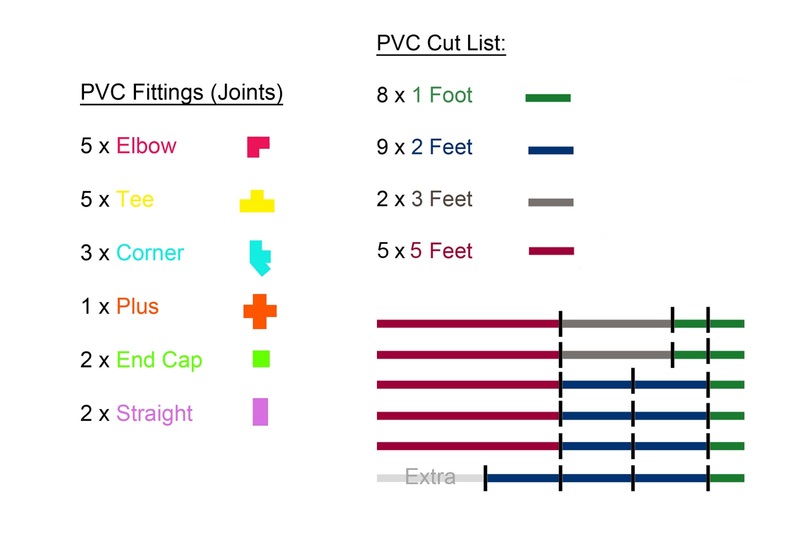 Pricing it all out on Lowes.com all my PVC was 28.14. add in a few extra 10 ft pieces for backdrops, some laminate flooring, and a piece of moulding and my total for setting up my first indoor studio (minus backgrounds) is 77.85! That means I still have about $60 of my budget left for a trip to the fabric store and a few cute props and I'll be all set. I'm lucky to have a husband who has done a lot of work with PVC for his aquaponic system so he has all the tools and experience I need to do the cutting and such. He may even have a few spare fittings around so that I don't have to buy them. Thank you so much for this tutorial. I am excited to be able to get started for a much lower investment than I thought. With my 10% discount at Home Depot everything and 3 clamps were 24 and some change. It was 27 and some change without the discount. That's also getting an extra 2 5' pipes for my backdrops. Also, Home Depot doesn't have a 3/4 inch corner piece that is 3/4 of an inch on all three sockets. So I had to buy 3 adapters for the 1/2 inch fitting. Which altered the height a bit. I just didn't fit certain corner pieces all the way into the fitting to make it work, but you can shave 1/4 - 1/2 of an inch to make up the difference for the adjustment. I purchased all the PVC pipe and fittings at Lowe's yesterday evening and bought 1 extra 10' pipe in case of a mishap. It was $32 for all of it. BEWARE! 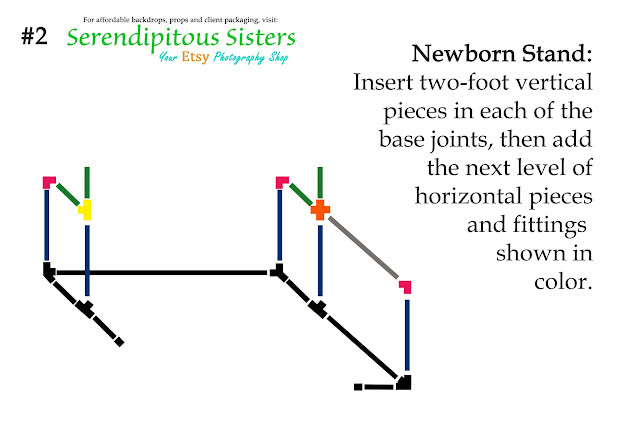 One person cannot balance 10' pieces of PVC on a shopping cart and pull down more to get all the pieces you need. It was a nightmare and of course, there were no employees in sight to help. I ended up laying the pipes across the hooks meant for the really wide pipes until I got all 7 pulled down, then I snagged a roll of packing tape from the work station of the non-existent employees, and wrapped the tape around the ends and center of my bundle of 7 pipes to secure them together. It was a slow walk to the checkouts trying not to bump anyone or anything. I complained to the cashier about the lack of help and service people and she graciously gave me a 10% discount.. Thank you for posting this. I'm thinking of making it tomorrow! Do you have any trouble taking your stand apart to adjust it to a different height? My pvc fittings are extremely tight fitting & are sometimes impossible to pull apart... but that's been my only challenge & I love the backdrop stand! That's why I like using the hack saw vs. the PVC cutters. They had the tendency to leave ridges on the pipe and made them difficult to put together and take it apart. It's a simple fix- just use a medium-sized file to take the ridges off, but be careful to not take off too much otherwise your joints will be too loose! Not fair! In Canada the cheapest I can find for a 10' length of 3/4" PVC is $9.77 at Home Depot. I can see online that Lowes.com sells it for less than $2! I called Lowes in Canada and it's $9.89. That is a serious bummer. After some research I do think it's due to government regulations. There have been movements to ban/tax PVC products here in the US because of environmental factors. I'm so sorry! Hi there. I was curious how wide your fabric is, and how big of a piece of linoleum you have for the floor? Did you put it on a piece of wood? It's such a great idea! Our backdrops are either exactly 5 feet or just under 5 feet wide. I have two types of snap-together laminate flooring (I can find here for $25ish on up per case depending on the style) and I also bought a canvas floor drop for a weathered white barnwood style. It was expensive, but I think I'm getting good use out of it. I put both on top of a thin 5'x5' piece of plywood because otherwise you have wrinkles in the vinyl or your floorboards will pop apart when you walk on them. It's not necessary if you have them on a hard floor, just carpet. :) I bought a 5' piece of baseboard and just clamp it to my fabric to pull it taught. Hope that helps! I've had plans for a more detailed post about flooring, but there it is in a nutshell. I cheated and bought cheap flat sheets, twin size, at Walmart. They work just as good as bulk fabric and are cheaper if they have a color that works for you. For Christmas, I have purchased a bright red flat sheet and will be hanging large snowflakes made from tongue depressors and painted white for a homemade 'photo booth' for our annual Gingerbread House Building party. Add a Polaroid camera and I think the kids will love it and the memories they can take with them! 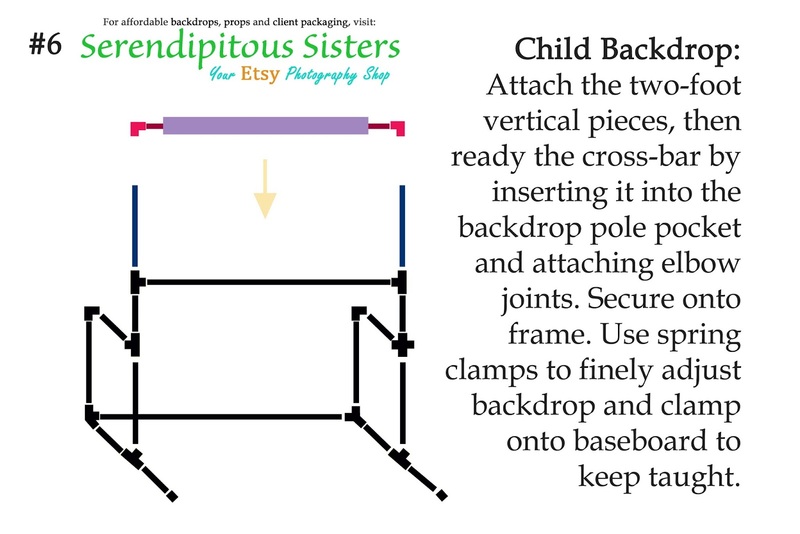 Do you have any pictures of the baby backdrop stand set up? That is a great question... I will work on that! Brilliant, look forward to seeing! DOn't suppose you have had a chance to get these photos sorted have you? I can't quite picture how it would work, especially the right hand side-wall. I have the same question... Can I see what the baby backdrop looks like once you have backdrop in place? I am making mine out of 40mm diameter waste pipe. I cannot find an equivalent connector (which you label corner). Any ideas what it is actually called? Here is a link to the Lowe's site. At the store I don't believe they have any names on their bins, just the diameter and price so it's a bit tricky. On their website they call them "side outlet elbows"... Best of luck! I was able to find them in my store, but I guess not everywhere carries them. Maybe search online??? If not, you could do a work around by using a t-joint, a small piece of pipe, and an elbow. Best of luck! Let me know how it goes. Still trying to find a way to work around this problem. I think I will get there soon. I am sorry! The PVC regulations of other countries are frustrating! If you cannot find the right Corner piece... try looking for a corner piece and an adapter that will make the corner piece the size you need. I had to do this with my corner pieces. 1/2 adapter screwed into the 1 part of the corner piece not 3/4 of an inch. This is amazing thanks so much! ! I'll be making my husband drive me to get the supplies to make this soon!! So have you had a chance to take some pictures of the baby stand (particularly the right wall) whilst it is set up completely? I had a newborn shoot today, and I will try and snap a few pictures of my setup tomorrow. I will comment when I do. I have four sessions to edit, one being a wedding, plus a few other callings to take care of. I'm crazy swamped! This is perfect thank you !! !,one question,do you have the floor for sale? cause I've been looking for that floor but I can't find it.Thank you in advance. The floor is from the website "Lemon Drop Stop," and the print is named "skinny worn white" in the 5'x5' size. :) Hope that helps! I (my husband) made this over the weekend!! We changed a few things though, like making the the width 8 ft instead of 5, running a support pipe verticle down the center, and another support pipe horizontal across the bottom. I can't wait to use it! Thanks for posting this! I can't wait to hear about your "affordable flooring solutions!" I have such good intentions for this site, but life just doesn't slow down enough to do everything I want to do! 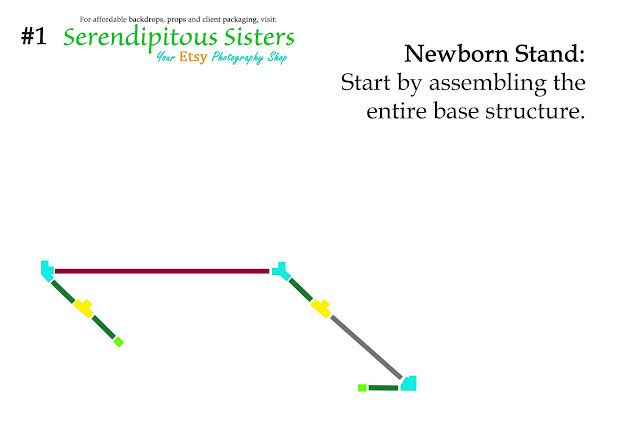 I will try so hard to remember to take some set-up shots with my newborn shoot this week. No promises on when anything will actually get posted though. :( Sorry!!! what kind of lighting system do you use? I have two speedlights and a set of radio transmitters... Both are off brand, cheap versions that have worked quite well for me these past few years! I set them up on light stands and reflective or shoot through umbrellas. Would you mind linking the particular ones you use? I love this! I'm going to Home Depot today! Gracias, Alea! Here is a reply to a previous, similar question about flooring: I have two types of snap-together laminate flooring (I can find here for $25ish on up per case depending on the style) and I also bought a canvas floor drop for a weathered white barnwood style. It was expensive, but I think I'm getting good use out of it. I put both on top of a thin 5'x5' piece of plywood because otherwise you have wrinkles in the vinyl or your floorboards will pop apart when you walk on them. It's not necessary if you have them on a hard floor, just carpet. :) I bought a 5' piece of baseboard and just clamp it to my fabric to pull it taught. Hope that helps! It was a great blog with nice topic regarding roll up stojala with providing great information. Keep writing. Wow!! Thanks so much for this! I ran across this post by accident while searching for backdrops, and I can't wait to get to building my own stand! I couldn't afford a 'nice' one, so I opted for a cheap back drop stand, and it is just that.. cheap.. it won't even stay standing! This looks like it will work wonderfully! :) Yay! Hey! This is such a fantastic idea. Im just starting out photographing kids and wanted something I could take to peoples houses and set up easily and obviously Im on a tight budget. Im going to have a go at buying and assembling the studio backdrop set up. Please could you tell me how big the flooring should be and if you use something under it if you are putting vinyl on top of carpet? Also I was wondering what you use for taking newborn photos? Ive been looking at DIY bean bags or ottomans but they are massive and I have no where to store them. What type of fabric do you use for your backdrops? Heavier type upholstery fabric, regular cotton? Just wondering. Also, how wide are your backdrops? Any special vendor where you purchase your fabric? Awesome and thanks for sharing. I'm new to photography. I have a Nikon D7100 and a Nikon SB 700. I have never used speedlights before. Any chance you could tell me what else I would need to pick up to start shooting with 3 or 4 lights? I built this today and am so excited to get some use out of it. All the directions were easy to follow and I purchased all my materials and pipe cutter for about $40 at Lowes. Once I had all the parts cut I was able to put this together in a matter of minutes. As a budding photographer cost is always an issue and this has made things so much easier. Thanks for sharing!!! Thank you so much for such a great tutorial. I put this together for under $20! I purchased the pvc at a plumbing shop and they cut it all for me at no additional cost. I'm not a photographer, but used it as a fun photo booth at a family party. It was a big hit! I can't wait to find a reason to use it again! can we get away with 1/2 PVC pipes instead of 3/4? Probably could, but even the 3/4 starts to bow at longer (5') lenghts. I'm afraid the 1/2" would really bow in the middle where you hang your backdrop. This is just fantastic! I am soooooooo impressed with your creativity! It was like a dream come true finding this great tutorial. I have a photobooth business and you have opened up a whole new world for me! This is brilliant. I'm so excited to make this! Thank you for the tutorial! Love your photography! 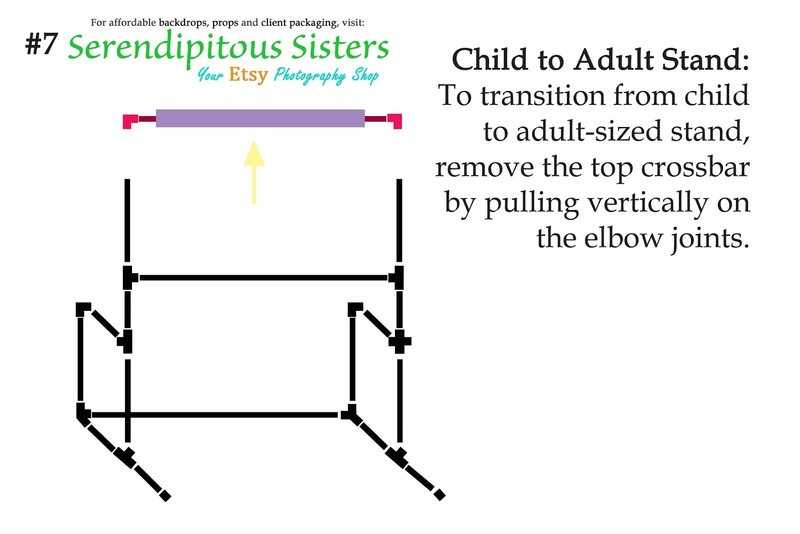 You have no idea of how much I appreciate this tutorial. I will follow your directions, no doubt!!!! Than you so much!!!! This is absolutely brilliant! I can't wait to build my own! Thank you! It's amazing for baby photography. this looks great! just wondering though, is there any reason (apart from financially) why this would be preferable over 2 photography stands and a monopole with clamps etc? trying to weigh it all up! For this size stand what size posing pillow do you use? Thanks and I love your tutorial! Thank you for posting! Do you think it could be made wider with center support? Great project using PVC Pipes. I bought the supplies about a month ago after reading and reading and READING this tutorial and I finally finished it today. I love it!! I don't have a space right now to keep it up completely but I am so excited to use it. I need to get some backdrops and get busy. Thank you very much for sharing this!! wow! I wanna make this at home. Your article is very interesting. I've read so much about things you can do on pvc pipes. thank you so much!!! I will use with my cakes... !!! What a good way of puting the baseboard in the back so it doesnt come out in the picture? Hi there! My husband bought everything but those 3 corner fittings you have shown in the Aqua blue color, Home Depot told him they are speciality fittings...where did you get them?! 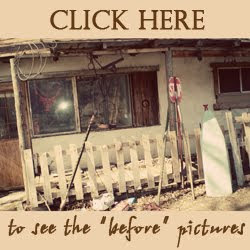 Wow now that is really wonderful sharing to help out others on a tight budget. 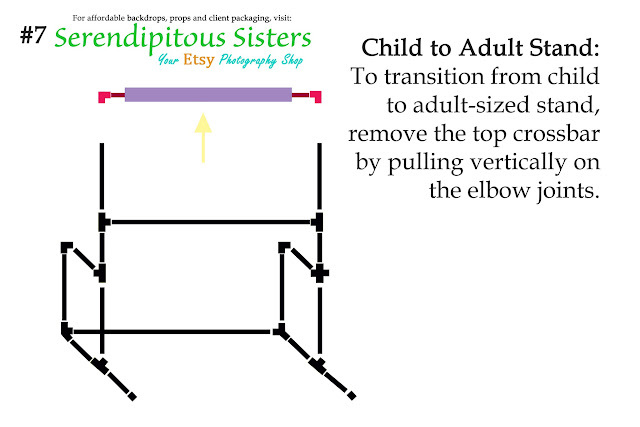 I sincerely appreciate you sharing and have gotten some wonderful ideas to make things a little easier on myself. Love the rolls stored on the wall easy to just pop in the stand. I just wanted to say thank you so much for sharing. 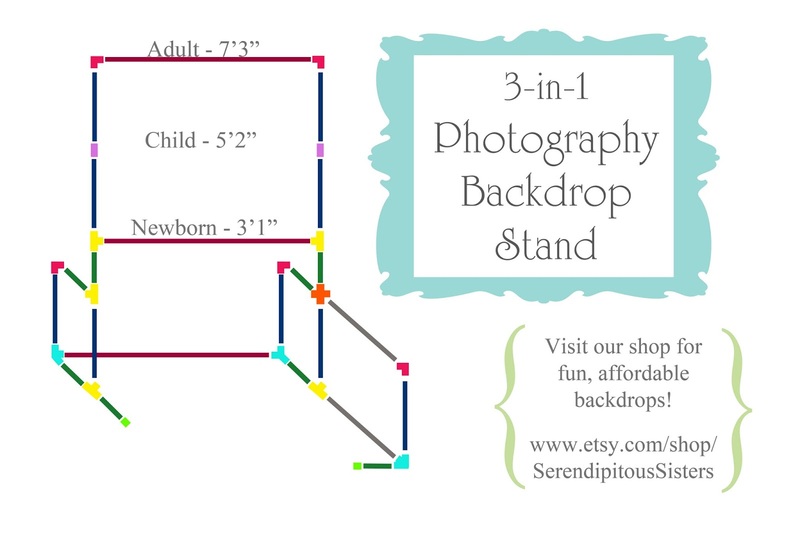 I constructed the backdrop stand with one modification. I made a set of 1 foot poles for the top so I don't need a stool and have the 2 foot poles ready if I need to full height. Your post truly helped me with a long overdue better setup. I bought fabric and a sewing machine will be attempting the pockets soon. I can't thank you enough. I wish something in your etsy shop fit what I do. I'd purchase from you in a second if you branch out into long backdrops. Hi & Thank you so much for sharing this!!! 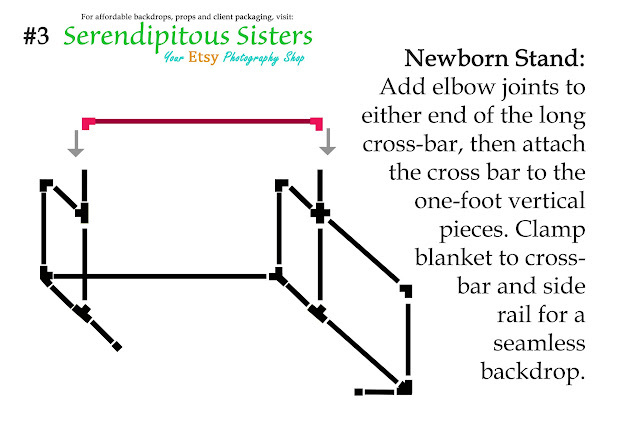 I built this stand for my sister's baby shower & my other sister's surprise bday party, and it was a hit!!! Everyones loved it! I am starting my own photography buisness and will be using this as my main backdrop. The only issue i am having is finding fabric wide enough to cover the sides of the stand. ugh please let me know what you are doing?? I just built this tonight and I LOVE IT! 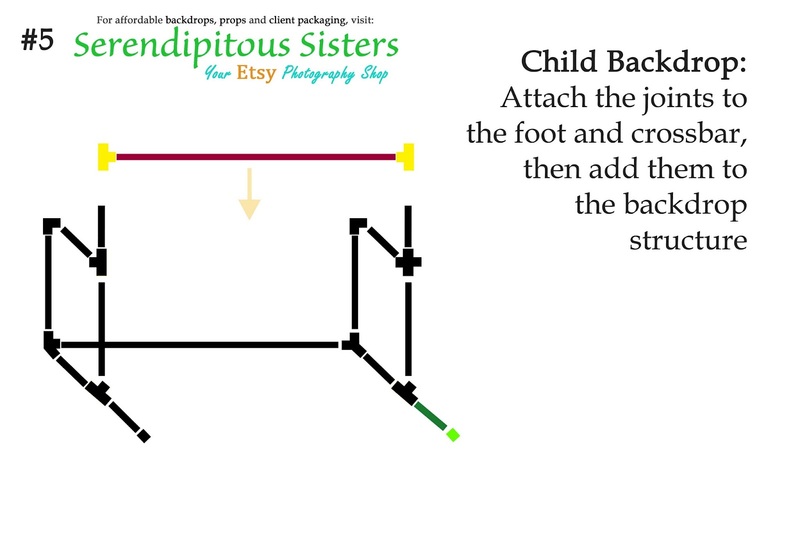 The directions were super easy to follow and I love that you color coded everything. Made it VERY easy to put together.. Thank you !!!! Brilliant, look forward to next post.. 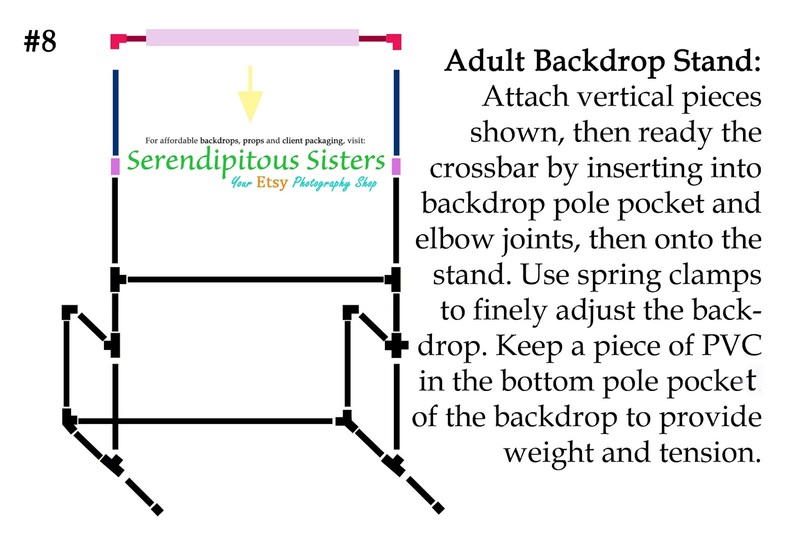 Following these easy ways, in no time you will have backdrop stand for your use. Helpful and informative. Thanks for sharing. Thanks a lot for sharing these wonderful ideas! I have been looking for the corner connector pieces and unfortunately, I havent found them anywhere! I dont live in the US, I have looked in 3 countries and in places like homecenter, home depot, i cant find them. Where did u find them? It looks like a piece that should be easily found, but it has not been for me. Very nice blog!! Thank you for sharing such useful information. PVC Roll is a good option to resist your office form dust. Nice Blog!! Great Post !! Like your Blog and your ideas and i think its benificial for us and i keep to visit your blog regularly because i got lot of information through you blog. This is incredible!! Thanks so much for sharing!! Hi there, would this be suitable for family pics and dessert table? Additionally, the fabric here in Australia is not wide enough, they are mostly sold with 112cm wide. Would you be able to recommend how to join 2 fabrics together? Thank you so much! You are very creative for this project. I can apply this on my future reference project using pipe fittings in the Philippines. This makes it a need to introduce another unit for plumbing and so PVC components came into existence. It is since then used along all kinds of applications, whether rigid or potable as it is not only high resistant to water contaminating materials but is also possess great durability. Thank you so much for this post! 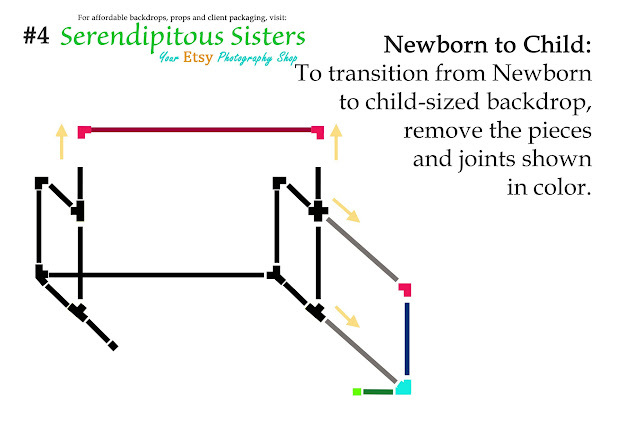 I am making one for my husband now :) Though I kinda ignored the cut diagram and now I'm one 5 ft piece short :/ Oops! I read this blog and i must say this one is very well written blog...keep it up. This is awesome! One question, can you show/explain how you set-up the newborn seemless backdrop? 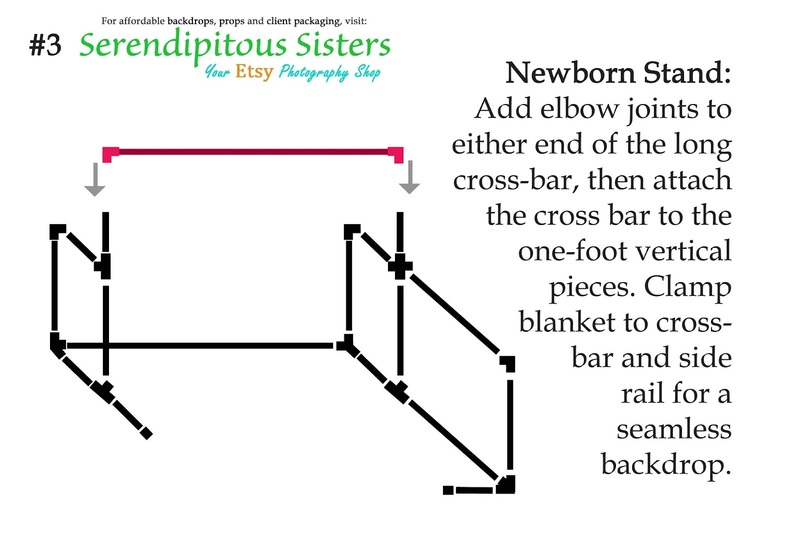 I'm curious how that works with the crossbar and siderails. Thank you! This is just a great reference tool! Hi there . This is the best tutorial for backdrop . It explains every detail . Thanks . Nice Share! Great article for backdrop. Very detailed and on point. Good efforts with images and descriptive post. Find wide selection of vinyl flooring service. We are dedicated to providing first quality merchandise and service to our customers. In fact, most of our customers come to us by word of mouth. Responsive industries are one of the best leading suppliers of Poly Vinyl Chloride flooring or PVC Flooring in our entire world. Its tiles which are generally utilized floor completion produced using PVC. Thank you i did really need this topic you share a very nice information about the newborn photo props great work. Why do you need all the different heights? Can't you just always use the adult height and keep it the same all the time? I see these posts are a few years old. Are you still available for questions? I found your information through Pinterest. Thanks! In canada at Home Depot for 10 feet 3/4 inch is only 2.99. I seen a comment from 2013 that says they were 9.77 a pipe. They must have been looking at the wrong type of PVC pipe. Great content. Nicely overall composed. I've been looking for this tutorial from a long time. I have started my career as freelance filmmaker in London and this helped me a lot in building my photography to a greater extent. تركيب هناجر وتصميمها هى من ضمن الخدمات التى تقدمها مؤسسة تصميم البناء الهندسى للمقاولات كما توفر الخدمات الاساسية الموافقة للمعايير المثالية فى تركيب الهناجر وذلك استكمالا لخدمات المؤسسة العامة فى مجالات: مظلات السيارات_ بناء بيوت الشعر_ تشييد السواتر_ تغطية الساحات_ نصب الشبوك وغيرها. تركيب الهناجر لدينا يتم بعد جلب واستيراد أجود مواد البناء والحديد من النخب الأول عالى المقاومة ضد الظروف البيئية المختلفة مما يحجب تأثير تقلبات الأجواء ويمثل حاجز مثالى قادر على حفظ كل المحتويات التى يتضمنها الهنجر. مؤسسة تصميم البناء الهندسى للمقاولات خبرة طويلة فى مجال تجهيزات وتنفيذ مشاريع الهناجر بأحجامها المختلفة على أيدى مهندسين وفنيين ذوى كفاءة عالمية. I love this DIY project!!! What a great, unique, easy idea.